A walking tour in the light of history. We like to think of the guide as the interpreter of the language of the stones of the city and the translator of the poem of history: our walking tour is a journey into the past history of Florence, meant to unveil the history hidden behind facades, statues and slabs, moving from main sites through medieval alleys and old squares sharing the stories of men and women that made this city so unique. 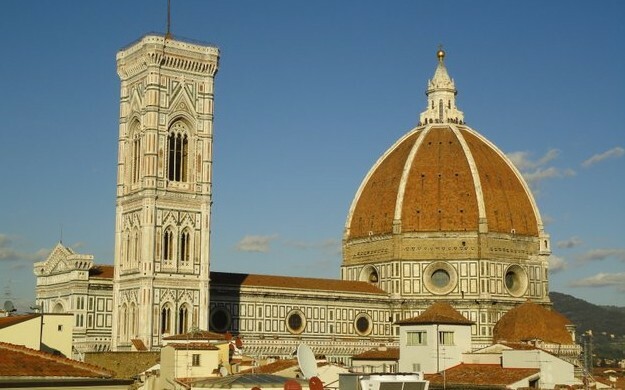 The Baptistry, the oldest Florentine monument, the Duomo of Santa Maria del Fiore, a magnificent gothic cathedral witnessing the splendor of the Medieval city, the bell-tower, with its elegant architecture by Giotto. The tour will enlighten the history and meaning of the buildings, and of the significant artworks: the “Paradise door”, the magnificent fresco of the dome, the reliefs of the tower come to life in front of you. The austere Palazzo Vecchio, focal point of the political life of the Florentine Republic, then headquarters of the Medici government and still today of the local government. The piazza Signoria is an open air museum, and has been home to the Michelangelo’s David for more than three centuries, and still displays magnificent sculptures like Cellini’s Perseus, and the fountain of Neptune. It is just a quick turn from the Square to the timeless elegance of the Uffizi Gallery, conceived by Giorgio Vasari in the XVI Century for the local administration. The mythological tales, the allegories and insights into stylistic and historical connections will make you feel a part of the history of Florence. The arches of the Old Bridge have reflected on the water for more than 650 years and support ever since the weight of the workshops above, the towers witnessed the fierce fights of Guelfs against Ghibellines, in the dim light of Romanesque churches life stopped in the times of Dante, in Orsanmichele learn about the guilds, the family mansions hiding courtyards and walled gardens. Reservations and Admissions no entrance fees or reservations. For groups above 5 partecipants headsets for the inner visit of the Duomo are mandatory.